In Shanghai China, The Goddard Group is currently designing Polar Ocean World, a marine-themed cultural park that will contribute to Shanghai’s overall tourism agenda. It is a project of the Haichang Holdings Group. The park will be built on a 300,000 meter site situated next to Dishui Lake. 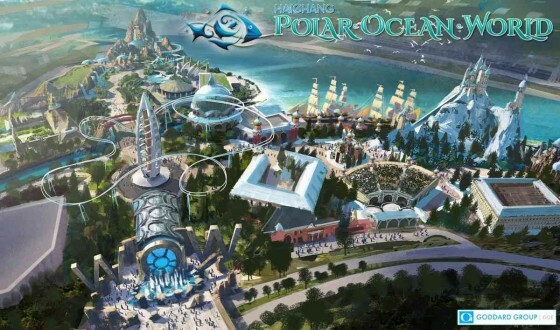 Polar Ocean World is scheduled to open in 2017 and will be Haichang’s seventh polar-themed destination in China. The park features 13 exhibition halls, four large animal encounter areas, 18 rides, cinemas, and more. The focus is to combine entertainment, ecology, and scientific research.